This article is about Northwestern Pacific tropical cyclones. For other uses, see Typhoon (disambiguation). For other areas in which tropical cyclones occur, see Tropical cyclone basins. 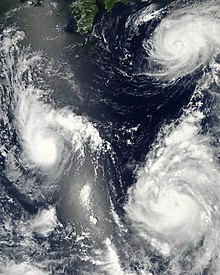 Three different tropical cyclones active over the Western Pacific Ocean on August 7, 2006 (Maria, Bopha, and Saomai.). The cyclones on the lower and upper right are typhoons. A typhoon is a mature tropical cyclone that develops between 180° and 100°E in the Northern Hemisphere. This region is referred to as the Northwestern Pacific Basin, and is the most active tropical cyclone basin on Earth, accounting for almost one-third of the world's annual tropical cyclones. For organizational purposes, the northern Pacific Ocean is divided into three regions: the eastern (North America to 140°W), central (140°W to 180°), and western (180° to 100°E). The Regional Specialized Meteorological Center (RSMC) for tropical cyclone forecasts is in Japan, with other tropical cyclone warning centers for the northwest Pacific in Hawaii (the Joint Typhoon Warning Center), the Philippines and Hong Kong. While the RSMC names each system, the main name list itself is coordinated among 18 countries that have territories threatened by typhoons each year  A hurricane is a storm that occurs in the Atlantic Ocean or the northeastern Pacific Ocean, a typhoon occurs in the northwestern Pacific Ocean, and a tropical cyclone occurs in the South Pacific or the Indian Ocean. Within the northwestern Pacific, there are no official typhoon seasons as tropical cyclones form throughout the year. Like any tropical cyclone, there are a few main requirements for typhoon formation and development: (1) sufficiently warm sea surface temperatures, (2) atmospheric instability, (3) high humidity in the lower to middle levels of the troposphere, (4) enough Coriolis effect to develop a low pressure center, (5) a pre-existing low level focus or disturbance, and (6) a low vertical wind shear. While the majority of storms form between June and November, a few storms do occur between December and May (although tropical cyclone formation is at a minimum during that time). On average, the northwestern Pacific features the most numerous and intense tropical cyclones globally. Like other basins, they are steered by the subtropical ridge towards the west or northwest, with some systems recurving near and east of Japan. The Philippines receive the brunt of the landfalls, with China and Japan being impacted slightly less. Some of the deadliest typhoons in history have struck China. Southern China has the longest record of typhoon impacts for the region, with a thousand-year sample via documents within their archives. Taiwan has received the wettest known typhoon on record for the northwest Pacific tropical cyclone basins. The term typhoon is the regional name in the northwest Pacific for a severe (or mature) tropical cyclone, whereas hurricane is the regional term in the northeast Pacific and northern Atlantic. Elsewhere this is called a tropical cyclone, severe tropical cyclone, or severe cyclonic storm. The Oxford English Dictionary cites Urdu ṭūfān and Chinese tai fung giving rise to several early forms in English. The earliest forms -- "touffon", later "tufan", "tuffon", and others—derive from Urdu ṭūfān, with citations as early as 1588. From 1699 appears "tuffoon", later "tiffoon", derived from Chinese with spelling influenced by the older Urdu-derived forms. The modern spelling "typhoon" dates to 1820, preceded by "tay-fun" in 1771 and "ty-foong", all derived from the Chinese tai fung. The Urdu source word توفان ṭūfān ("violent storm"; cognate to Hindi तूफ़ान (tūfān)) comes from the Persian (Persian: توفان/طوفان‎ tūfān meaning "storm" which comes from the verb (Persian: توفیدن/طوفیدن‎ tūfīdan (Persian: توفیدن/طوفیدن‎, "to roar, to blow furiously"). The word طوفان (ṭūfān) is also derived from Arabic as coming from ṭāfa, to turn round. The Chinese source is the word tai fung or taifeng (simplified Chinese: 台风; traditional Chinese: 颱風; pinyin: táifēng). The modern Japanese word, 台風 (たいふう, taifuu), is also derived from Chinese. The first character is normally used to mean "pedestal" or "stand", but is actually a simplification of the older Chinese character 颱, which means "typhoon"; thus the word originally meant "typhoon wind". The Ancient Greek Τυφῶν (Typhôn, "Typhon") is not unrelated and has secondarily contaminated the word. The Persian term may originally have been influenced by the Greek word. A tropical depression is the lowest category that the Japan Meteorological Agency uses and is the term used for a tropical system that has wind speeds not exceeding 33 knots (38 mph; 61 km/h). A tropical depression is upgraded to a tropical storm should its sustained wind speeds exceed 34 knots (39 mph; 63 km/h). Tropical storms also receive official names from RSMC Tokyo. Should the storm intensify further and reach sustained wind speeds of 48 knots (55 mph; 89 km/h) then it will be classified as a severe tropical storm. Once the system's maximum sustained winds reach wind speeds of 64 knots (74 mph; 119 km/h), the JMA will designate the tropical cyclone as a typhoon—the highest category on its scale. From 2009 the Hong Kong Observatory started to further divide typhoons into three different classifications: typhoon, severe typhoon and super typhoon. A typhoon has wind speed of 64-79 knots (73-91 mph; 118–149 km/h), a severe typhoon has winds of at least 80 knots (92 mph; 150 km/h), and a super typhoon has winds of at least 100 knots (120 mph; 190 km/h). The United States' Joint Typhoon Warning Center (JTWC) unofficially classifies typhoons with wind speeds of at least 130 knots (67 m/s; 150 mph; 241 km/h)—the equivalent of a strong Category 4 storm in the Saffir-Simpson scale—as super typhoons. However, the maximum sustained wind speed measurements that the JTWC uses are based on a 1-minute averaging period, akin to the U.S.' National Hurricane Center and Central Pacific Hurricane Center. As a result, the JTWC's wind reports are higher than JMA's measurements, as the latter is based on a 10-minute averaging interval. There are six main requirements for tropical cyclogenesis: sufficiently warm sea surface temperatures, atmospheric instability, high humidity in the lower to middle levels of the troposphere, enough Coriolis force to develop a low pressure center, a pre-existing low level focus or disturbance, and low vertical wind shear. While these conditions are necessary for tropical cyclone formation, they do not guarantee that a tropical cyclone will form. Normally, an ocean temperature of 26.5 °C (79.7 °F) spanning through a depth of at least 50 metres (160 ft) is considered the minimum to maintain the special mesocyclone that is the tropical cyclone. These warm waters are needed to maintain the warm core that fuels tropical systems. A minimum distance of 500 km (300 mi) from the equator is normally needed for tropical cyclogenesis. Whether it be a depression in the Intertropical Convergence Zone (ITCZ) or monsoon trough, a broad surface front, or an outflow boundary, a low level feature with sufficient vorticity and convergence is required to begin tropical cyclogenesis. About 85 to 90 percent of Pacific typhoons form within the monsoon trough. Even with perfect upper level conditions and the required atmospheric instability, the lack of a surface focus will prevent the development of organized convection and a surface low. Vertical wind shear of less than 10 m/s (20 kn, 33 ft/s) between the ocean surface and the tropopause is required for tropical cyclone development. Typically with Pacific typhoons, there are two outflow jets: one to the north ahead of an upper trough in the Westerlies, and a second towards the equator. In general, westerly wind increases associated with the Madden–Julian oscillation lead to increased tropical cyclogenesis in all tropical cyclone basins. As the oscillation propagates from west to east, it leads to an eastward march in tropical cyclogenesis with time during that hemisphere's summer season. On average, twice per year twin tropical cyclones will form in the western Pacific Ocean, near the 5th parallel north and the 5th parallel south, along the same meridian, or line of longitude. There is an inverse relationship between tropical cyclone activity in the western Pacific basin and the north Atlantic basin, however. When one basin is active, the other is normally quiet, and vice versa. The main reason for this appears to be the phase of the Madden–Julian oscillation, or MJO, which is normally in opposite modes between the two basins at any given time. Nearly one-third of the world's tropical cyclones form within the western Pacific. This makes this basin the most active on Earth. Pacific typhoons have formed year round, with peak months from August to October. The peak months correspond to that of the Atlantic hurricane seasons. Along with a high storm frequency, this basin also features the most globally intense storms on record. One of the most recent busy seasons was 2013. Tropical cyclones form in any month of the year across the northwest Pacific Ocean, and concentrate around June and November in the northern Indian Ocean. The area just northeast of the Philippines is the most active place on Earth for tropical cyclones to exist. Across the Philippines themselves, activity reaches a minimum in February, before increasing steadily through June, and spiking from July through October, with September being the most active month for tropical cyclones across the archipelago. Activity falls off significantly in November, although Typhoon Haiyan, the strongest Philippine typhoon on record, was a November typhoon. The most frequently impacted areas of the Philippines by tropical cyclones are northern and central Luzon and eastern Visayas. A ten-year average of satellite determined precipitation showed that at least 30 percent of the annual rainfall in the northern Philippines could be traced to tropical cyclones, while the southern islands receive less than 10 percent of their annual rainfall from tropical cyclones. The genesis and intensity of typhoons are also modulated by slow variation of the sea surface temperature and circulation features following a near-10-year frequency. Tracks of all tropical cyclones in the northernwestern Pacific Ocean between 1980 and 2005. The vertical line to the right is the International Date Line. Most tropical cyclones form on the side of the subtropical ridge closer to the equator, then move poleward past the ridge axis before recurving north and northeast into the main belt of the Westerlies. Most typhoons form in a region in the northwest Pacific known as typhoon alley, where the planet's most powerful tropical cyclones most frequently develop. When the subtropical ridge shifts due to El Niño, so will the preferred tropical cyclone tracks. Areas west of Japan and Korea tend to experience many fewer September–November tropical cyclone impacts during El Niño and neutral years. During El Niño years, the break in the subtropical ridge tends to lie near 130°E, which would favor the Japanese archipelago. During La Niña years, the formation of tropical cyclones, and the subtropical ridge position, shift westward across the western Pacific Ocean, which increases the landfall threat to China and greater intensity to Philippines. Those that form near the Marshall Islands find their way to Jeju Island, Korea. Typhoon paths follow three general directions. Straight track (or straight runner). A general westward path affects the Philippines, southern China, Taiwan, and Vietnam. A parabolic recurving track. Storms recurving affect eastern Philippines, eastern China, Taiwan, Korea, Japan, and the Russian Far East. Northward track. From point of origin, the storm follows a northerly direction, only affecting small islands. A rare few storms, like Hurricane John, were redesignated as typhoons as they originated in the Eastern/Central Pacific and moved into the western Pacific. Within the Western Pacific, RSMC Tokyo-Typhoon Center, part of the Japan Meteorological Agency has had the official warning responsibility for the whole of the Western Pacific since 1989, and the naming responsibility for systems of tropical storm strength or greater since 2000. However each National Meteorological and Hydrological Service within the western Pacific has the responsibility for issuing warnings for land areas about tropical cyclones affecting their country, such as the Joint Typhoon Warning Center for United States agencies, the Philippine Atmospheric, Geophysical and Astronomical Services Administration (PAGASA) for interests in the island archipelago nation, and the Hong Kong Observatory for storms that come close enough to cause the issuance of warning signals. The list of names consists of entries from 17 Southeast and East Asian nations and the United States who have territories directly affected by typhoons. The submitted names are arranged into a list, the names on the list will be used from up to down, from left to right. When all names on the list are used, it will start again from the left-top corner. When a typhoon causes damage in a country, the affected country can request for retiring the name in the next session of the ESCAP/WMO Typhoon Committee. A new name will be decided by the country whose name was retired. Unlike tropical cyclones in other parts of the world, typhoons are not named after people. Instead, they generally refer to animals, flowers, astrological signs, and a few personal names. However, Philippines(PAGASA) retains its own naming list, which does consist of human names. Storms that cross the date line from the central Pacific retain their original name, but the designation of hurricane becomes typhoon. In Japan, people use the numerical designation of typhoons according to the sequence of their occurrence in the calendar year. The most active Western Pacific typhoon season was in 1964, when 39 storms of tropical storm strength formed. Only 15 seasons had 30 or more storms developing since reliable records began. The least activity seen in the northwest Pacific Ocean was during the 2010 Pacific typhoon season, when only 14 tropical storms and seven typhoons formed. In the Philippines, the most active season, since 1945, for tropical cyclone strikes was 1993 when nineteen tropical cyclones moved through the country. There was only one tropical cyclone that moved through the Philippines in 1958. The 2004 Pacific typhoon season was the busiest for Okinawa since 1957. Within Guangdong in southern China, during the past thousand years, the most active decades for typhoon strikes were the 1660s and 1670s. The highest reliably-estimated maximum sustained winds on record for a typhoon were those of Typhoon Haiyan at 195 miles per hour (314 km/h) shortly before its landfall in the central Philippines on November 8, 2013. The most intense storm based on minimum pressure was Typhoon Tip in the northwestern Pacific Ocean in 1979, which reached a minimum pressure of 870 hectopascals (26 inHg) and maximum sustained wind speeds of 165 knots (85 m/s, 190 mph, 310 km/h). The deadliest typhoon of the 20th century was Typhoon Nina, which killed nearly 100,000 in China in 1975 due to a flood that caused 12 reservoirs to fail. After Typhoon Morakot landed in Taiwan at midnight on August 8, 2009, almost the entire southern region of Taiwan (Chiayi County/Chiayi City, Tainan County/Tainan City (now merged as Tainan), Kaohsiung County/Kaohsiung City (now merged as Kaohsiung), and Pingtung County) and parts of Taitung County and Nantou County were flooded by record-breaking heavy rain. The rainfall in Pingtung County reached 2,327 millimeters (91.6 in), breaking all rainfall records of any single place in Taiwan induced by a single typhoon, and making the cyclone the wettest known typhoon. ^ Chris Landsea (2010-06-01). "Subject: F1) What regions around the globe have tropical cyclones and who is responsible for forecasting there?". Journal of Geophysical Research: Atmospherges=D06108. Retrieved 2011-03-30. ^ a b "What is the difference between a hurricane, a cyclone, and a typhoon?". OCEAN FACTS. National Ocean Service. Retrieved 2016-12-24. ^ Glossary of Meteorology (2012). "Typhoon". American Meteorological Society. Retrieved 2015-04-05. ^ Glossary of Meteorology (2012). "Hurricane". American Meteorological Society. Retrieved 2015-04-05. ^ Chris Landsea (2010-06-01). "Frequently Asked Questions Subject: A1) What is a hurricane, typhoon, or tropical cyclone?". National Hurricane Center. Retrieved 2011-03-24. ^ a b c The Compact Edition of the Oxford English Dictionary, Volume II, page 559, "Typhoon". Oxford University Press, 1971. ^ a b c Online Etymology Dictionary: "typhoon"
^ The Arabic Contributions to the English Language: An Historical Dictionary by Garland Hampton Cannon and Alan S. Kaye considers typhoon "a special case, transmitted by Cantonese, from Arabic, but ultimately deriving from Greek. [...] The Chinese applied the [Greek] concept to a rather different wind [...]"
^ a b c d Typhoon Committee (2008). "Typhoon Committee Operational Manual" (PDF). World Meteorological Organization. Retrieved 2008-12-23. ^ a b c "Classifications of Tropical cyclones" (PDF). Hong Kong Observatory. 2009-03-18. Retrieved 2009-04-27. ^ Joint Typhoon Warning Center (2008-03-31). "What are the description labels used with tropical cyclones by JTWC?". Joint Typhoon Warning Center – Frequently Asked Questions (FAQ). Retrieved 2008-12-22. ^ "How are JTWC forecasts different than forecasts issued by tropical cyclone warning centres (TCWCs) of other countries?". Joint Typhoon Warning Center. 2008-03-31. Retrieved 2008-12-26. ^ a b Chris Landsea (1 June 2010). Subject: A15) How do tropical cyclones form ? National Hurricane Center. Retrieved on 2011-03-24. ^ a b Roger Graham Barry & Andrew Mark Carleton (2001). Synoptic and dynamic climatology. Psychology Press. pp. 520–521. ISBN 978-0-415-03115-8. Retrieved 2011-03-06. ^ John Molinari & David Vollaro (September 2000). "Planetary- and Synoptic-Scale Influences on Eastern Pacific Tropical Cyclogenesis". Monthly Weather Review. 128 (9): 3296–307. Bibcode:2000MWRv..128.3296M. doi:10.1175/1520-0493(2000)128<3296:PASSIO>2.0.CO;2. ^ Roger Graham Barry & Richard J. Chorley (2003). Atmosphere, weather, and climate. Psychology Press. p. 271. ISBN 978-0-415-27170-7. Retrieved 2011-03-06. ^ E. D. Maloney & D. L. Hartmann (September 2001). "The Madden–Julian Oscillation, Barotropic Dynamics, and North Pacific Tropical Cyclone Formation. Part I: Observations". Journal of the Atmospheric Sciences. 58 (17): 2545–2558. Bibcode:2001JAtS...58.2545M. CiteSeerX 10.1.1.583.3789. doi:10.1175/1520-0469(2001)058<2545:TMJOBD>2.0.CO;2. ^ a b James B. Elsner & Kam-Biu Liu (2003-10-08). "Examining the ENSO-Typhoon Hypothesis" (PDF). Climate Research. 25: 43. Bibcode:2003ClRes..25...43E. doi:10.3354/cr025043. Retrieved 2007-08-18. ^ Colleen A. Sexton (2006). Philippines in Pictures. Twenty-First Century Books. p. 16. ISBN 978-0-8225-2677-3. Retrieved 2008-11-01. ^ Edward B. Rodgers; Robert F. Adler & Harold F. Pierce (October 2000). "Contribution of Tropical Cyclones to the North Pacific Climatological Rainfall as Observed from Satellites". Journal of Applied Meteorology. 39 (10): 1662. Bibcode:2000JApMe..39.1658R. doi:10.1175/1520-0450(2000)039<1658:COTCTT>2.0.CO;2. hdl:2060/19990109670. ^ Joint Typhoon Warning Center (2006). "3.3 JTWC Forecasting Philosophies" (PDF). United States Navy. Retrieved 2007-02-11. ^ Jonathan Belles (July 6, 2016). "Typhoon Alley: Where the Planet's Most Intense Tropical Cyclones Most Frequently Happen". The Weather Company. Retrieved April 12, 2019. ^ a b M. C. Wu; W. L. Chang & W. M. Leung (2003). "Impacts of El Nino-Southern Oscillation Events on Tropical Cyclone Landfalling Activity in the Western North Pacific". Journal of Climate. 17 (6): 1419–1428. Bibcode:2004JCli...17.1419W. CiteSeerX 10.1.1.461.2391. doi:10.1175/1520-0442(2004)017<1419:IOENOE>2.0.CO;2. ^ David J. Nemeth (1987). The architecture of ideology: neo-Confucian imprinting on Cheju Island, Korea. University of California Press. p. 51. ISBN 978-0-520-09713-1. Retrieved 2011-03-06. ^ a b Japan Meteorological Agency (2001-05-25). "Annual Report on Activities of the RSMC Tokyo – Typhoon Center: 2000" (PDF). pp. iii, 11. Retrieved 2011-03-11. ^ Naval Meteorology and Oceanography Command (2011). "Products and Service Notice". United States Navy. Retrieved 2011-03-11. ^ Philippine Atmospheric, Geophysical & Astronomical Services Administration (2004). "Mission/Vision". Archived from the original on 2004-04-22. Retrieved 2011-03-11. ^ Hong Kong Observatory (September 2010). "Tropical Cyclones in 2009" (PDF). pp. 18–19. Retrieved 2011-03-11. ^ "How typhoons are named". USA Today. 2007-11-01. Retrieved 2008-08-18. ^ “Kai-tak" was retired, the new name will be decided on the 51th Session of the ESCAP/WMO Typhoon Committee. ^ “Tenbin" was retired, the new name will be decided on the 51th Session of the ESCAP/WMO Typhoon Committee. ^ “Hato" was retired, the new name will be decided on the 51th Session of the ESCAP/WMO Typhoon Committee. ^ Joint Typhoon Warning Center (2009). "Member Report Republic of the Philippines" (PDF). Philippine Atmospheric, Geophysical and Astronomical Services Administration. World Meteorological Organization. Retrieved 2010-04-14. ^ Erik Slavin (2005-05-30). "Preparation critical for Japan's coming typhoon season". Stars and Stripes. Retrieved 2011-03-06. ^ Kam-Biu Liu; Caiming Shen & Kin-Sheun Louie (2001). "A 1,000-Year History of Typhoon Landfalls in Guangdong, Southern China, Reconstructed from Chinese Historical Documentary Records". Annals of the Association of American Geographers. 91 (3): 453–464. doi:10.1111/0004-5608.00253. ISSN 0004-5608. ^ Samenow, Jason; McNoldy Brian (2013-11-08). "Among Strongest Storms Ever". The Washington Post. Retrieved 2013-11-08. ^ George M. Dunnavan; John W. Diercks (1980). "An Analysis of Super Typhoon Tip (October 1979)". Monthly Weather Review. 108 (11): 1915–1923. Bibcode:1980MWRv..108.1915D. doi:10.1175/1520-0493(1980)108<1915:AAOSTT>2.0.CO;2. ISSN 1520-0493. ^ Anderson-Berry, Linda J.; Weyman James C. (2008-02-26). "Fifth International Workshop on Tropycal Cyclones: Topic 5.1: Societal Impacts of Tropical Cyclones". World Meteorological Organization. National Oceanic and Atmospheric Administration. Retrieved 2011-03-31. ^ Arizona State University (2009-08-12). "Taiwan Rainfall Record Investigation". Archived from the original on 2011-01-02. Retrieved 2011-03-06. ^ "Record rains in south". The China Post. 2009-08-09. Archived from the original on 2009-08-12. Retrieved 2009-08-09.